G20 (the Group of Twenty) refers to the 20 influential economies in the world. It consists of 19 countries and the European Union (EU). The members of the G20 are Argentina, Australia, Brazil, Canada, China, France, Germany, India, Indonesia, Italy, Japan, Republic of Korea (South Korea), Mexico, Russia, Saudi Arabia, South Africa, Turkey, the United Kingdom, the United States and the EU. The term 'energy intensity' generally means the amount of energy consumed per unit of gross domestic product (GDP) in a country. It is calculated by dividing a country's total (primary or final) energy consumption by the country's GDP. It shows an overall energy efficiency of the country's economy. By GDP at 2005 Purchasing Power Parity, the global primary energy intensity was improved from 10.215 MJ/dollar (or 0.244 toe/$1000) in 1990 to 7.904 MJ/dollar (0.189 toe/$1000) in 2010. The global final energy intensity passed almost the same direction as the primary one by enhancing the efficiency from 7.320 MJ/dollar (0.175 toe/$1000) to 5.376 MJ/dollar (0.128 toe/$1000) during the same period (See the last two figures of this post.). Just like the global energy intensities, G20 members' energy intensities have generally improved over the last two decades. Although the American Council for an Energy-Efficient Economy (ACEEE) recently published an International Energy Efficiency Scorecard (Young et al., 2014), I wanted to compare countries not by scores but by absolute performances. 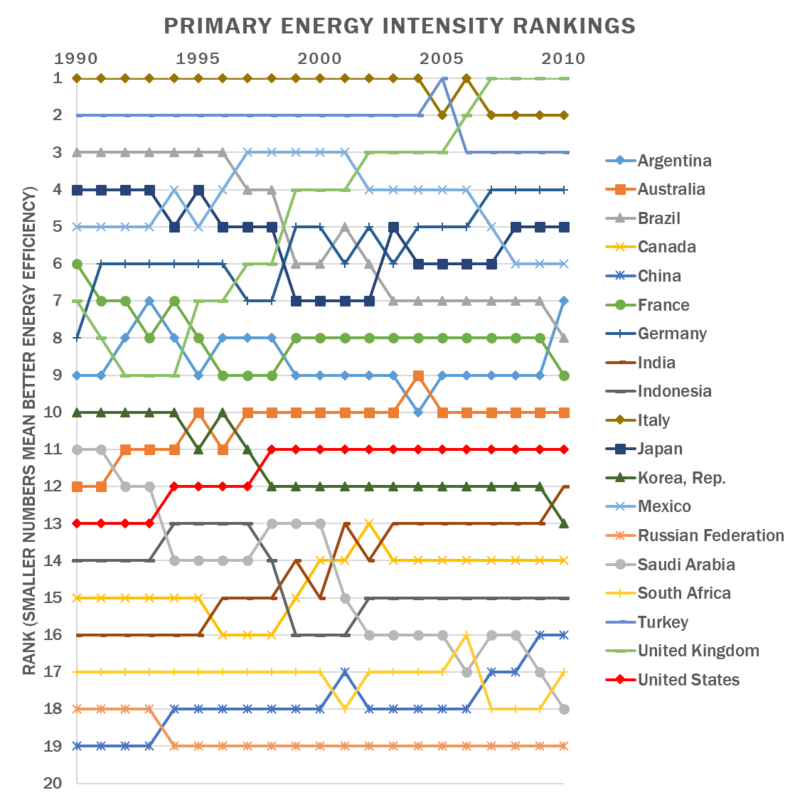 Using the World Bank's data compiled for the United Nation's "Sustainable Energy for All" initiative, I compared energy intensities of the 19 countries (i.e., G20 excluding the EU) and ranked each country annually. 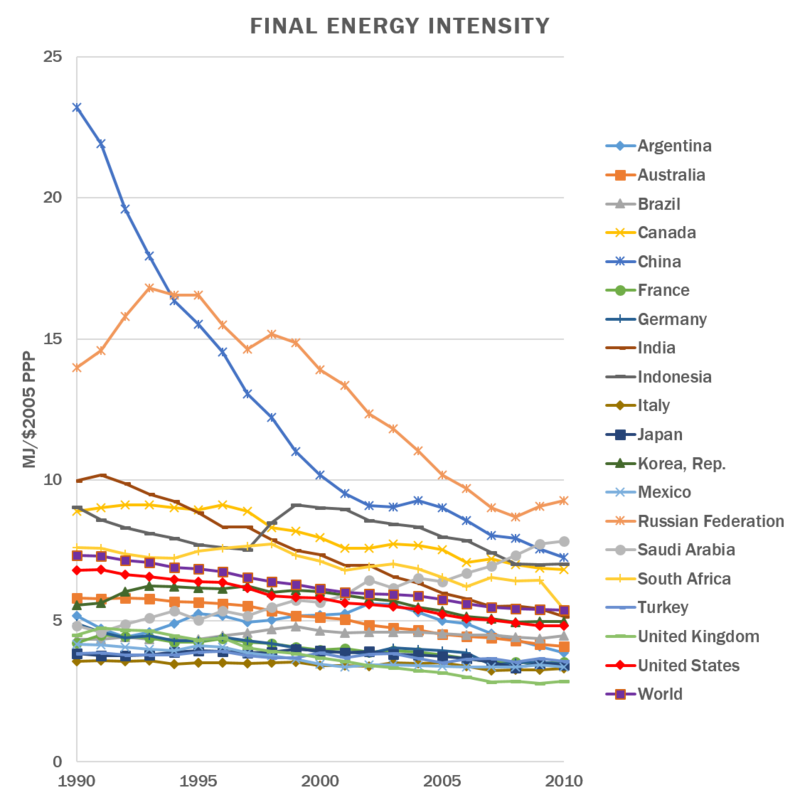 Actual energy intensity numbers are also provided after the rankings figures. The United Kingdom has achieved a tremendous gain in its economy's energy efficiency. It was 7th both in primary and final energy rankings in 1990. In 2010, it boasts the most energy-efficient economy. Germany and India jumped up 4 ranks in both primary and final energy intensity rankings over 1990-2010. China climbed up the primary energy intensity rankings ladder by 3 steps. Australia improved its final energy intensity rankings by 3 steps. By absolute ranks, Russia showed the poorest energy efficiency both in primary and final energy intensities. However, the worst performing country in energy efficiency improvement was Saudi Arabia. In 1990, the country was 11th in primary energy intensity rankings and 8th in final energy intensity rankings. Saudi Arabia's 2010 ranking was 18th by both energy intensities. 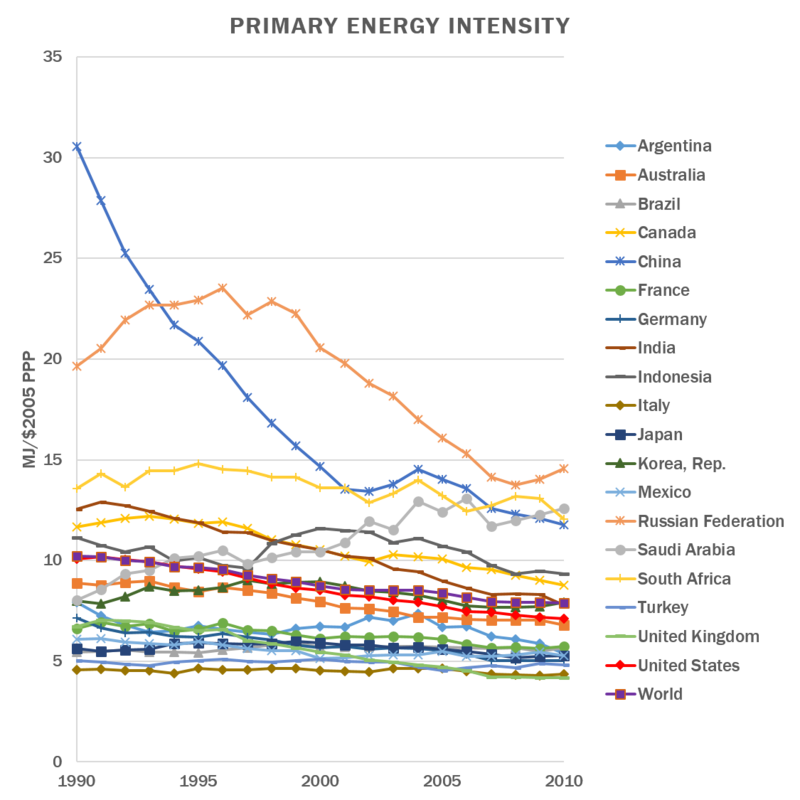 Brazil was the second most-demoted country in the primary energy intensity rankings by sliding 5 ranks over 1990-2010. France and South Korea fell by 3 steps in the same rankings. 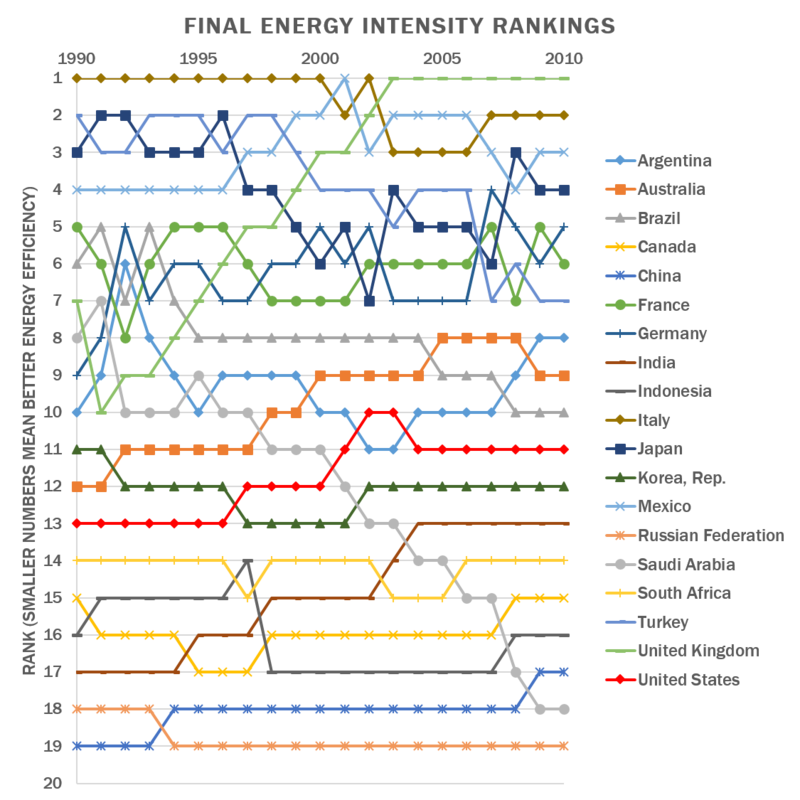 In the final energy intensity rankings, however, Turkey showed the second biggest lapse (5 steps) next to Saudi Arabia's, defeating Brazil's 4-step decline. (1) Energy intensity level of primary energy (MJ/$2005 PPP): A ratio between energy supply and gross domestic product measured at purchasing power parity. Energy intensity is an indication of how much energy is used to produce one unit of economic output. Lower ratio indicates that less energy is used to produce one unit of output. (2) Energy intensity level of final energy (MJ/$2005 PPP): A ratio between final energy consumption and gross domestic product measured at purchasing power parity. Energy intensity is an indication of how much energy is used to produce one unit of economic output. Lower ratio indicates that less energy is used to produce one unit of output.